"Rewriting" isn't The Washington Post's problem. It might even be a part of the solution. He said the newspaper faced two business problems: the Rewrite Problem and the Debundling Problem. In the latter, whereas people once bought a paper and read and passed sections of it around, the Web has debundled the paper so that people can read one story and move on to a different site. Not to completely rewrite Matt Yglesias, but the Rewrite Problem isn't much of a problem -- especially compared to the Debundling Problem. Just think about the causality and chronology. The Washington Post's readership and revenue collapse is new. Very new. Since 2008, daily circulation has fallen from about 670,000 to 470,000. But the Rewrite Problem is old. Reader's Digest, which became the single biggest magazine in the world thanks to rewriting, is old. Book reviews are old. Columns and news stories that piggy-back on other people's exhaustive reporting? They're old, too. All journalism, even the most investigative reporting, relies somewhat on the Rewrite "Problem." Reporters are all little dwarves standing on the shoulders of giants. What's new is the Internet and its debundling of the business model that supported all of this news-gathering, reporting, and rewriting, in the first place. 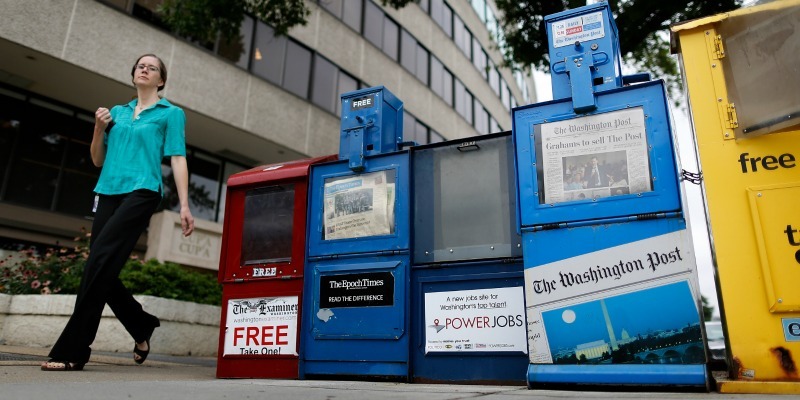 Newspapers are bundles of paper, but they're bundles of businesses, too. Marketing in the classifieds, sports, cars, and real estate sections have always subsidized the capital-N News on the front page. (Serious News, after all, has never paid for itself.) But readers abandoned broadsheets, since they could get their news from a million free sources, few of which required allegiance in the form of a paid subscription. Advertisers moved with them -- in particular, advertisers in the back pages that supported journalism in the front pages. The Washington Post used to claim a quasi-monopoly on local newspaper advertising. Today, it doesn't even have the zip-code's most famous political coverage. But if Bezos wants to keep his margins low (even when they're negative margins), the best way to match less revenue with spending is, of course, to spend less money. For this, the Post already has a model in WorldViews, The Fix, Wonkblog and The Switch -- that is, whip-smart, quite-young, decently affordable journalists doing targeted reporting, value-add analysis and, well, lots and lots of rewriting.